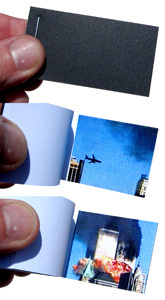 Scott Blake has created a flipbook consisting of images of United Airlines Flight 175 crashing into the south tower of the World Trade Center. Accompanying the animation are essays written by a wide range of participants, each expressing their personal experience of the September 11th attacks. 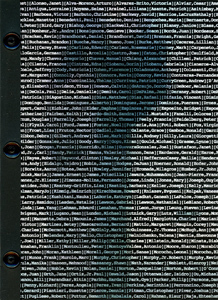 In addition, the authors of the essays are asked to reflect on, and respond to, the flipbook itself. Not surprisingly, the majority of the essayists experienced the events through news network footage. Blake is distributing his 9/11 Flipbooks to encourage a constructive dialog regarding the media�s participation in sensationalizing the tragedy. "My primary goal with the 9/11 Flipbook is to remind everyone how the mainstream media broadcast the violent attacks over and over," Blake said. "I believe the news acted against peaceful society on 9/11 and terrorized the viewing public by showing those images over and over, giving power to the very people that wanted to frighten us." To further illustrate his point, Blake recently conducted a media study of archived footage from September 11, 2001, counting the number of times major news networks showed the plane crashes, building collapses and people falling from the towers. The BBC showed the planes crashing into the towers 240 times, roughly 16 times per hour. 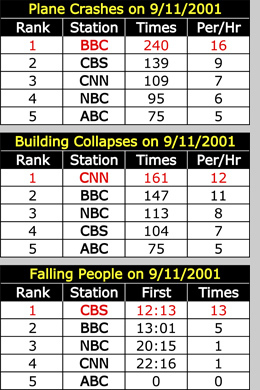 CNN showed the towers collapsing 161 times, or about once every five minutes. CBS was the first to show victims falling from the towers, beginning around noon and replaying the footage 13 times that day. These images are burned indelibly into the minds of everyone who witnessed the tragedy, whether firsthand or remotely. Said one New York essayist in Blake's 9/11 Flipbook, "We could literally see the towers from our roof top. Although we had a better view on the TV." Blake personally assembles each flipbook in his studio in Omaha, NE. The books are printed, cut and bound using top of the line archival materials. The large flipbooks are bound using screw post binding, which is one of the most archival book binding methods. Both versions are signed, dated. 100% of the profits from every 9/11 Flipbook sold is donated to the Twin Towers Orphan Fund, Fire Department of New York, and International Red Cross. Registered Copy Anonymous Copy ?